How Will the New ELAR TEKS Impact Future Instruction? Home Collaborative Circle Blog How Will the New ELAR TEKS Impact Future Instruction? In my last blog post, “Reading Instruction Non-Negotiables,” I shared a list of reading non-negotiables that are paramount to effective reading instruction. As we begin the second semester of the school year, I thought this would be an opportune time to review the new English Language Arts and Reading (ELAR) Texas Essential Knowledge and Skills (TEKS) that will go into effect for the 2019–2020 school year for Kindergarten through grade 8. I’d like to unpack some of the changes, what those changes mean for teachers, and how a firm foundation in your reading non-negotiables will guide and support you and your students on the road ahead. Literacy Principle #1: The interconnected nature of listening, speaking, reading, and writing must be central and explicit so that the skills central to literacy development are taught as both integrated and recursive. Literacy Principle #2: Every strand must include thinking, since the development of literacy skills is dependent on students’ ability to think clearly, coherently, and flexibly about what they are reading, writing, viewing, listening to, and discussing. Literacy Principle #3: The role of text complexity in literacy development (and in the differentiation of certain skills from grade to grade) must be central and explicit. Literacy Principle #4: The alignment of knowledge and skills must make sense vertically—from grade to grade within a strand—so that the curricular structure on which instruction is based is purposeful, coherent, and appropriately scaffolded. Again, the new TEKS prompt teachers to interconnect reading, writing, listening, and speaking. This task, which may appear to be a heavy load, is naturally inclusive within your reading non-negotiables. 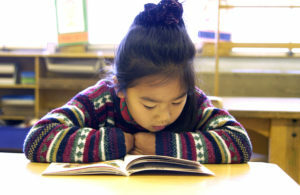 Reading non-negotiables allow students to build on the strategies, skills, and competencies they are learning. For example, during your independent reading portion of the day students self-select text to read and unpack using those literacy strategies taught during a whole group shared lesson. As you walk around to confer one on one with students, your goal is to listen, question, probe, and note students’ abilities to listen, speak, read, and write. When utilized on a daily basis, reading non-negotiables address student expectations. Additionally, it’s crucial that you consider how your instructional curriculum and materials align with the new ELAR TEKS and your reading non-negotiables. What you want is curriculum that not only supports the TEKS but also those fundamental opportunities students need as part of their reading block. Finally, the curriculum you decide to adopt should be a tool you can use to begin the transformational work needed to ensure both you and your students succeed. Happy New Year!